At an outdoor movie set resembling Panmunjeom village at the border of the two Koreas, Jeon Young Pyo, 57, was having his photo taken as he re-enacted with his wife the historic moment of the South and North Korean leaders shaking hands when they met for their summit on April 27. The former school teacher is among the many South Koreans and foreign tourists showing up at the Korean Film Council's Namyangju Studios east of Seoul, still excited by the inter-Korean summit talks that took place for the first time on the southern side of the border of the two countries after the 1950-1953 Korean War. "I felt tempted to come here because the summit was held in Panmunjeom," Jeon, who lives in Pyeongtaek, a city south of Seoul, said Thursday, adding that he could not think of any alternative to feel the summit venue close to him, given that South Koreans are not easily allowed access to the actual Panmunjeom. The Panmunjeom movie set was created for the shooting of one of South Korea's blockbuster movies "JSA: Joint Security Area" released in 2000, which depicted the secret friendship between soldiers of the two Koreas. 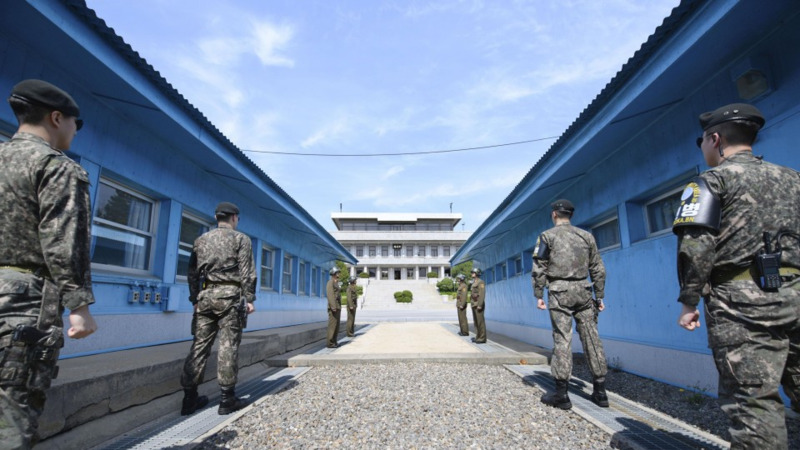 Similar to the real JSA, which is the official name of Panmunjeom, blue buildings are located on a concrete slab that mimics the Military Demarcation Line separating the two countries. On the "northern" side of the line stands a replica of the North Korean building Panmungak. But the site is also very different in that there are no security guards and no tension there. Students were seen taking selfies and children easily crossed to the "North" side apparently unaware of the tragic reality of the world's most heavily militarized border. 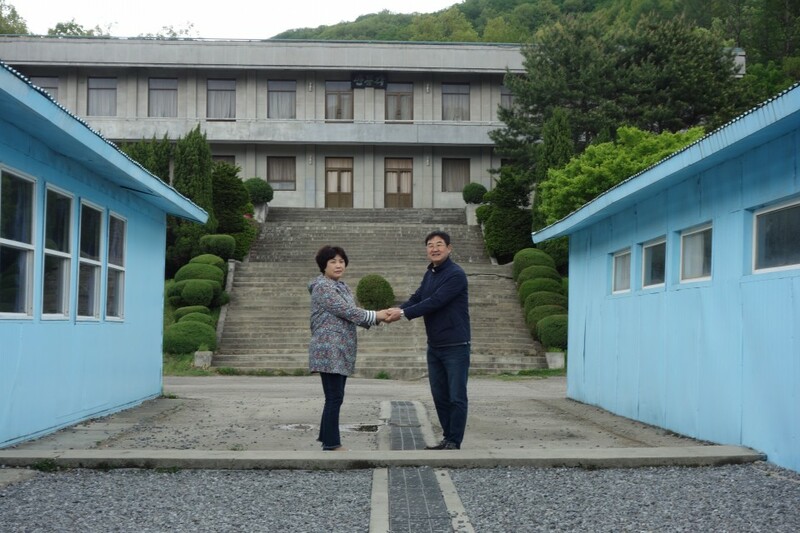 Still for Jeon and others, a visit to "Panmunjeom," albeit a movie set, appears to be a meaningful way to celebrate what appears to be progress toward reconciliation between the two countries, and to reaffirm their hope for lasting peace on the Korean Peninsula. Calling the talks between South Korean President Moon Jae In and North Korean leader Kim Jong Un "very nice," Jeon said, "Both South and North Koreans are wishing for peace. The demarcation line is something that has just been drawn by politicians." In the Korean War, North Korea sought by force to reunite the Korean nation, divided at the 38th parallel into a Soviet-occupied north and a U.S.-occupied south at the conclusion of World War II. The war ended with an armistice, not a peace treaty. Along that parallel, the peninsula remains split by the Demilitarized Zone, or DMZ, a 4-kilometer wide, 250-km-long stretch of land. "I've gone to a lot of countries around the world, but not North Korea. I hope to visit North Korea in the near future," Jeon said. Roh Ki Hong, a 61-year-old former journalist, enthusiastically spoke of how his impression of the North Korean leader changed through the summit, in which TV footage showed Kim together with Moon stepping over the demarcation line hand in hand. Kim was also shown hugging Moon with a broad smile, telling jokes, and listening intently during their talks. "I had thought that Mr. Kim was a brutal person, but I changed my mind. He appears to be reasonable," Roh said and added, "I hope the JSA will become a symbol of a peaceful Korea, or a symbol of a united Korea, not a symbol of division." In a joint declaration signed between Moon and Kim following their talks, the two agreed to pursue "complete" denuclearization of the Korean Peninsula and to strive to declare a formal end to the Korean War this year. They also agreed to transform the DMZ into a "peace zone," having already started off by removing propaganda loudspeakers both countries have placed at the border. But it remains to be seen whether Panmunjeom can truly be transformed into a symbol of peace and become an area just like the movie set where visitors can cross the border laughing, smiling and relaxed. 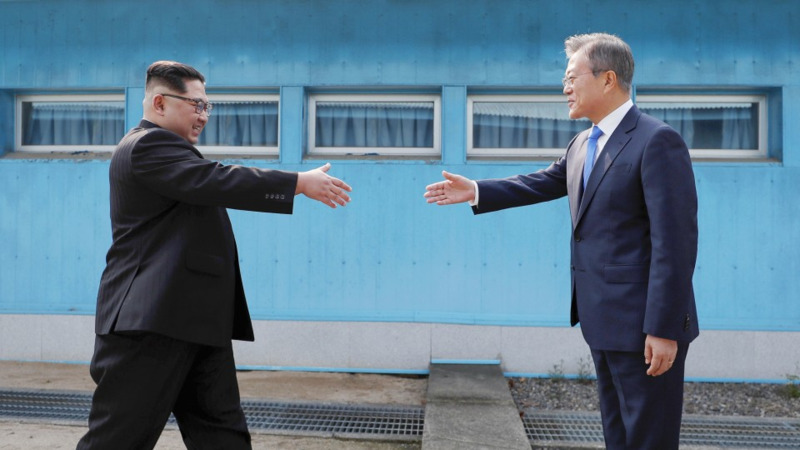 A South Korean said he had mixed feelings when he watched a scene which some media called a "dance" between the two leaders as they stepped back and forth over the border before returning to the South Korean side hand in hand in a show of unity ahead of the start of their talks. "I had a chance to go to Panmunjeom when I was young and I was really shocked (to witness the tense border). But the two leaders looked as if they were having fun as they crossed the border," he said. "Is the demarcation line something that can easily be crossed over like that? When I think the many lives that have been changed and even sometimes lost because of that line, I don't think so."